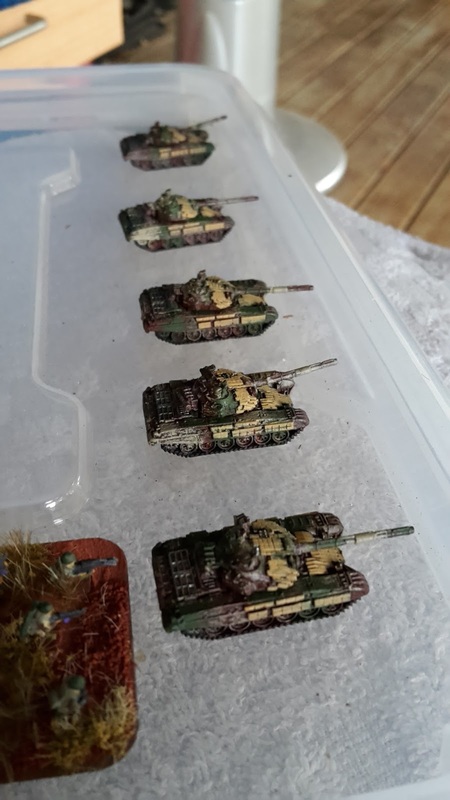 Down Under Wargames - Miniature battles in the Southern Land: Musorians on the Move! 1930Z MUSORIAN FORCE ELEMENT DETECTED CROSSING MUS/AUS BORDER. CONTACT LOST WITH FORWARD RECON ELEMENTS FOLLOWING DISPATCH OF FOLLOWING IMAGES. 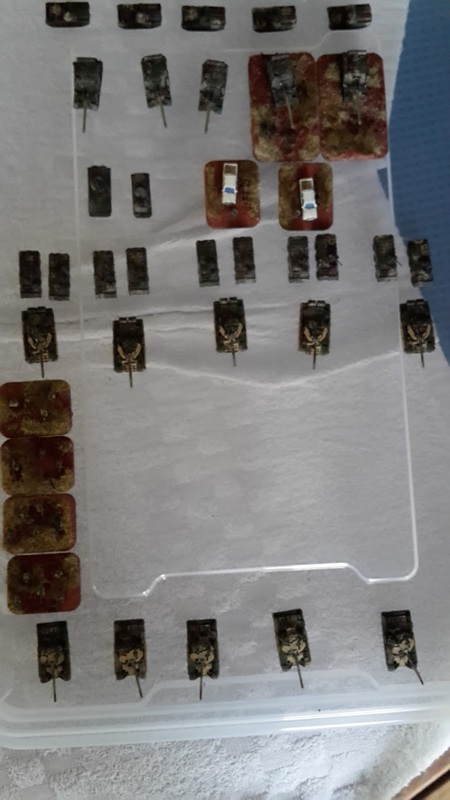 LIKELY ELEMENTS OF MUSORIAN 4TH REPUBLIC GUARD. SF ELEMENTS MOBILISED TO CONDUCT INITIAL ASSESSMENTS AND SPOILING RAIDS. MORE TO FOLLOW. Well, I am finally getting back from being on hiatus again - although 'hiatus' is a strong word to use in this instance, as I have been quite busy with painting up my models. Since last report I have actually completed a full Australian Special Forces troop section; a small USMC raiding force - and a majority of a Musorian strike element as shown below! 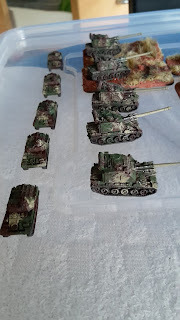 These models have even had the opportunity to be put on display and shown to the public here up North in Townsville, so with luck I will begin to stimulate some interest in the 6mm community up here. For the models, I decided to base this particular force around the concept of the Musorians being more or less a "not Syrian/not Iraq pre-Gulf War" group - they are the big players in the region, but not so big that they would be willing to operate alone... there will eventually be a Russian element within the Musorian forces, much like there will eventually be a Chinese element within my Kamarians. 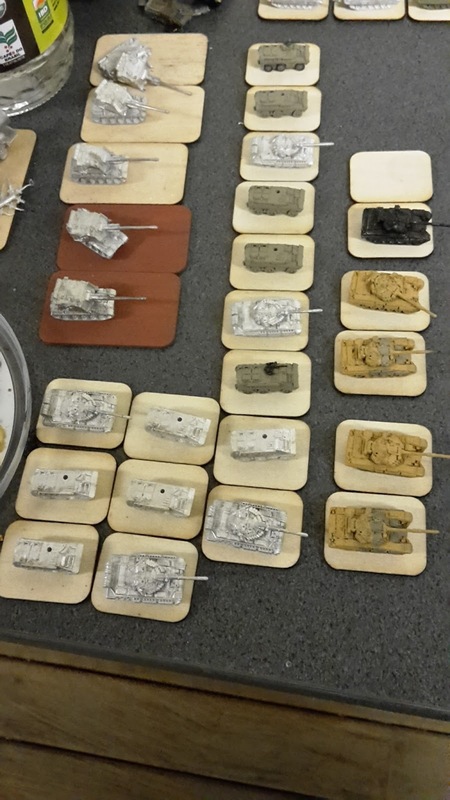 The left image shows the main armour used by the Musorian Republic Guard - the T-72M TURMS. I had the idea to do some slight modification to a GHQ T-72M (India) pattern after looking at 'TACOBAT's efforts on doing the same thing *here's the link* on his Modern Warfare blog, I was suitably amped up to make my own. However; as they are supposed to be in Australia, I wanted them to look a little different... and so I went with a Hull Red with German Camo Dark Green and Khaki 'dabbing' to give the look of a dedicated camo scheme. On the table, they look amazing! The ERA blocks were painted sand yellow for the purposes of 'breaking up' the model. I like my units to have something that distinctly breaks the model into segments, be it the weapon barrel or some other distinguishing feature... it helps to make the board visually appealing to passerbys as well. 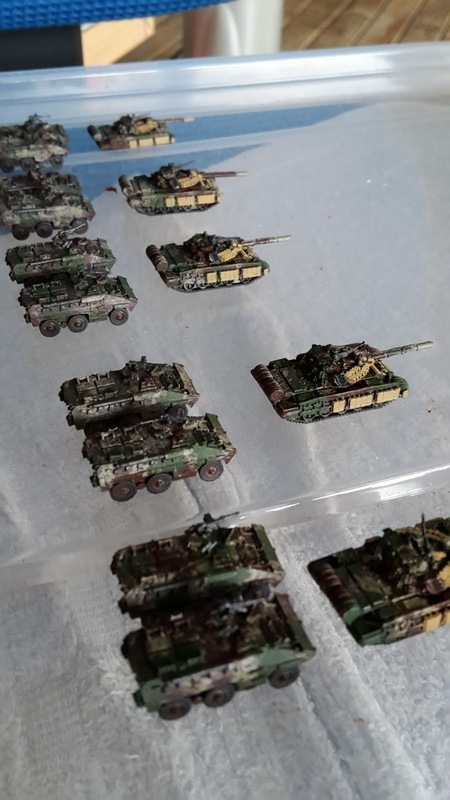 Next to be painted were my T-55MV's and EE-11 Urutu's - they will be utilised in support of the infantry and there will eventually be a dedicated T-55 unit supporting the T-72s. The use of Explosive Reactive Armour in Musorian use will be dedicated only to the Musorian Republican Guard units... 'normal' units will have T-55Ms, T-62s, T-72s of various build without ERA; and some T-90s. The T-90s *the Indian GHQ variant* are the exception to the rule and are molded with the latest Russian KONTAKT ERA - in setting they are like the real-world sale of T-90 tanks to the Syrians, being used to fill a gap that existed between capabilities and necessities. I particuarly like how the GCT howizters and the VCI's finished up, I think they are the best examples of the painting style in the army to date!